The panoramic camera aboard NASA's Mars Exploration Rover Opportunity acquired this panorama of the "Payson" outcrop on the western edge of "Erebus" Crater during Opportunity's sol 744 (Feb. 26, 2006). From this vicinity at the northern end of the outcrop, layered rocks are observed in the crater wall, which is about 1 meter (3.3 feet) thick. The view also shows rocks disrupted by the crater-forming impact event and subjected to erosion over time. To the left of the outcrop, a flat, thin layer of spherule-rich soils overlies more outcrop materials. The rover is currently traveling down this "road" and observing the approximately 25-meter (82-foot) length of the outcrop prior to departing Erebus crater. The panorama camera took 28 separate exposures of this scene, using four different filters. 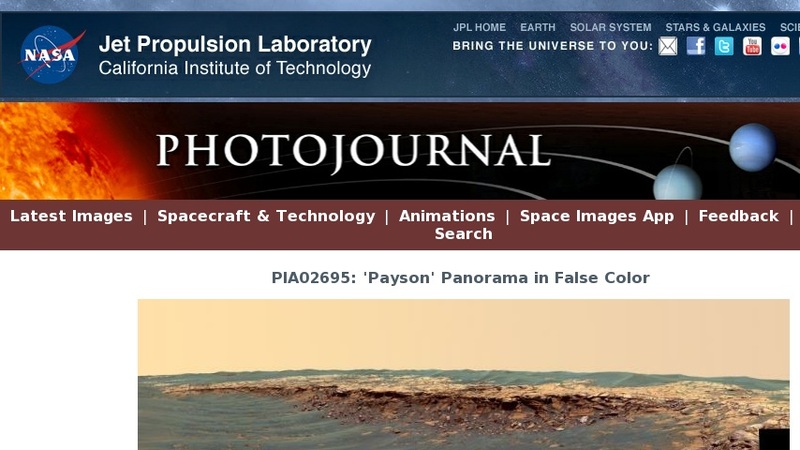 The resulting panorama covers about 90 degrees of terrain around the rover. This false-color rendering was made using the camera's 753-nanometer, 535-nanometer and 423-nanometer filters. Using false color enhances the subtle color differences between layers of rocks and soils in the scene so that scientists can better analyze them. Image-to-image seams have been eliminated from the sky portion of the mosaic to better simulate the vista a person standing on Mars would see.